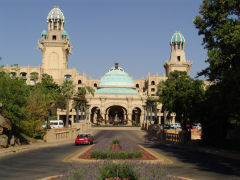 The conference is to be held in the main conference centre at Sun City near Rustenburg. Sun City adjoins the magnificent Pilanesberg National Park (situated in the crater of a long-extinct volcano) - home to the Big 5 and a malaria-free area. Please see the hotel website for further details about the wide variety of facilities available. Internet access is available at the hotel.